The Third Party Inspection for Shell and Tube Heat Exchanger article provides a sample procedure for heat exchanger inspection and tsting. This procedure should be reviewed in conjunction with heat exchanger inspection and test plan. This content guides you through all the necessary stages in the production of the shell and tube heat exchangers, including the construction material, fabrication, inspection, testing, preservation and packing, and dispatch to site. You need to take this point into account, this article is written for a typical shell and tube heat exchanger and might not be detailed for special cases. All shell and tube heat exchanger inspection and testing is done against the approved drawings, purchase order specifications, purchasers or company standards, and within the practices and rules of the country, state or province and any government decrees, laws, ordinance or regulation as may apply. The applicable codes and standard may be based other international standards such as BS 5500, etc. This content is general and can be useful if even the design code is different from ASME Code. But if the purchase order has mandated the MTR to be provided for all components, such as nozzle pipes, fittings, etc., then the manufacturer needs to provide them as well. For more details, you may review the Pressure Vessel Plate article. As mentioned above, the original or authenticated copies of mill certificates for plates normally are available at the manufacturer's premises. Then the inspector witnesses the plate material identification on the certificates against the plate marking. It is also necessary to check the identification with the shell and tube heat exchanger drawing datasheet, material list and other specifications as appropriate. The transfer identification to cut off plates also is checked. Visual inspections for surface finish and probable defects are done and dimensional compliance with specification also needs to be controlled. For more detail about shell and tube heat exchanger raw material inspection, you may review the Pressure Vessel Dimension Inspection article. When the shell and tube heat exchanger material inspection is carried out, and the results were satisfactory or non-conformities were closed by remedial action, then the shell and tube heat exchanger manufacturer will start fabrication. The third party inspector checks the following points on the shell and tube heat exchanger based on the inspection and test plan (ITP), which has already been agreed upon between the purchaser and the shell and tube heat exchanger manufacturer. The third party inspector carries out the visual and dimensional check to ensure compliance with WPS and other specifications. Where specified, weld bevels are examined by the required code method after grinding/machining. It is necessary that the edges and weld bevels are clean, dry and free from surface defects, laminations, cracks, voids, notches, etc. They are causes for rejection unless suitable/satisfactory remedial action can be taken. Weld repairs are carried out in accordance with the code requirements and approved by the client before welding proceeds and serious or excessive defects normally are reported. Shapes and dimensions are checked in accordance with the approved WPS and drawing. Tack welds are produced using the applicable WPS conditions, and it is necessary to be visually free from defects. Magnetic Testing (MT) or Penetration Testing (PT) may be performed in accordance with the code requirement. The third party inspector controls preheat heat temperature and method, interpass temperatures, weld material control, welder and process qualifications for conformity to the code requirements. The third party inspector controls the shape and dimensions of the back gouged groove for conformity to the WPS requirement. It is necessary that the visual appearance is clean and free from defects. NDE examination is done in accordance with the code requirement. After completion of all welding and grinding operations, a visual examination confirms there are no harmful defects such as cracks, lack of fusion, surface porosity or exposed slag inclusions, incomplete penetration, incorrect profile of the weld, lack of leg length and overlap. Temporary attachments are removed, ground smooth, and the areas are checked for defects by MP or PT for defects. NDE is performed by qualified personnel by the approved techniques. The techniques available are dependent on the vessel classification and the materials used. The level of radiographic testing depends on design and service (like lethal services) and should be made based on designed joint efficiency. 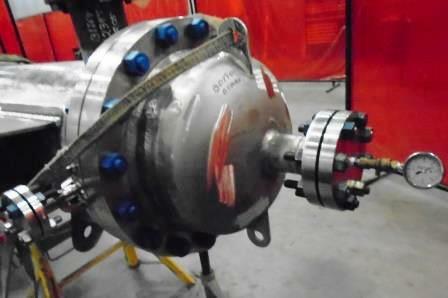 The shell and tube heat exchanger weld repairs are completed using an approved WPS method and retested accordingly. It is necessary that all repairs are approved before any post weld heat treatment is carried out. The third party inspector reviews the post weld heat treatment record of the temperature and time in accordance with the approved code/procedure. The results of hardness tests are reviewed in accordance with the code requirements. Mock-up test is made when required by purchase order or contract. Identification, visual appearance and dimensions, weld control, PT, section of weld, Macro-observation, hardness check of weld metal and heat affected zone are checked as required. Tubes after bending for thinning particularly on the back of bends. Tube sheet and baffle plate, including tube hole, heads, flanges, tubes, flange facing finish. Channel, shell, floating head, cover, tube bundle assembly. Template check of shell is performed in accordance with the applicable specifications as required. Size and construction of template are to be checked, and the template pass smoothly, without binding through the full length of the shell. Direction and orientation of nozzle, impingement baffles, lugs and external, internal fittings are checked. Out of roundness, diameters, length, wall thickness, straightness of shell are checked. Expansion ratio of tube ends is checked. Tubes to be checked for thinning after expansion. U-tubes are formed from a single length having no circumferential welds, and flattening need not exceed 10% of the nominal OD of tube. Tube sheet flatness on gasket contact surface is checked as required. Tube bundle insertion is checked as required. Cleanliness, insertion without binding, contact of tube sheet and shell flange and gasket used need to be confirmed. The third party inspector witnesses the low pressure pneumatic test for nozzle reinforcing pads, support saddles or other attachments when specified by approved low pressure pneumatic test procedure using soapy water as the indicating medium. A minimum of 1 gauge with correct working ranges as described by the code is used. Adequate provision for venting of high points and draining are provided. Special requirements of the purchaser's specification for deflection or strain gauges or pressure/time/temperature recordings is examined by the inspector and records verified. For more detail in hydro-static testing, review the Vessel Pressure Testing and heat exchanger inspection articles..
After hydro-static testing, the vessel is thoroughly drained and dried out by approved methods. All internal fittings, attachments, coatings or other requirements need to be completed. The specified post hydrostatic test NDE needs to be completed and the vessel closed. All shell and tube heat exchangers are checked for cleanliness and dryness by an approved method. The third party inspector rechecks the nozzle, saddle and bracket locations and orientations against the assembly drawings. The content of the marking is checked in accordance with approved drawing and specifications by the third party inspector. Name plate need to be mounted on bracket welded to shell at the height specified. Cleaning method (Solvent cleaning, white metal blast cleaning, near white blast cleaning, commercial blast cleaning, etc. Surface Profile i.e. 2 thru 3 mil, etc. Surface condition needs to be free from pin-holes, runs damage and other discontinuity. The third party inspector controls spares, tools and accessories and makes visual and dimensional inspection for materials, workmanship and quantity according to the purchase order specification and packing list. The marking and/or tag is checked for identification. The third party inspector provides an Inspection Visit Report (IVR) after each visit, as well as a final report summarizing the activities carried out during the shell and tube heat exchanger production in accordance with the contract requirements and circulated within the time limits specified in the contract. The report is in the format required by the client and clearly indicates final acceptance or rejection of the shell and tube heat exchanger. When required by the contract or purchase order, a release note is issued by the third party inspection agency and given to the manufacturer when the shell and tube heat exchangers have been accepted. Where nitrogen purge is specified the gas pressure is checked and the presence of warning notices checked.